Super fast and easy. Love the design. Just right to inspire us! Great product, Great service! I recommend. My boyfriend really liked the print I had made from this digital file. He’s a huge JFK fan and this was a great gift for him. A NYC area native, Michelle is a BFA graduate of The College of Saint Rose, and has worked for 15+ years in the graphic design industry. Like many invitation designers, Michelle got her start designing invitations and paper goods for her own wedding, in 2008. From there, she began designing for family and friends’ weddings and events. With each event, came an opportunity to create new designs, explore techniques, and expand selection of materials. After receiving many compliments and more requests, Michelle made the decision to shift her business focus from corporate graphic design to something a little more meaningful. Enchanted Prints was born as a place to create designs for all of life's celebrations. 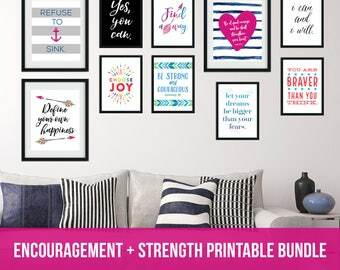 What started as a shop to sell digital versions of the wedding invitations that Michelle had designed through the years, grew to include party invitations, holiday cards, art prints, and gifts. Michelle finds such joy in helping her customers create the perfect piece for their home or special event. She is honored to have the opportunity to be a part of these occasions and celebrations. Living by the principle that being a designer is a lifestyle and not just a job, every piece is created with meaning, and fueled by a passion for good design. I'm a Graphic Designer and Creative Blogger living out my dream in The Sunshine State, where I live with my sweet hubby and adorable kitties. I love color, typography, and creating designs that are equally beautiful and meaningful. Michelle's sister and assistant extraordinaire. Allison helps keep the shop stocked, responds to messages, and helps customers process their orders. She lives in New Jersey with her hubby, her son and the cutest little Doberman. To ensure the highest quality product, all printed products are printed professionally via a small, USA-based printer. Every product is designed, ordered and managed by me and then sent to the printer where they package and ship directly to you! Welcome! 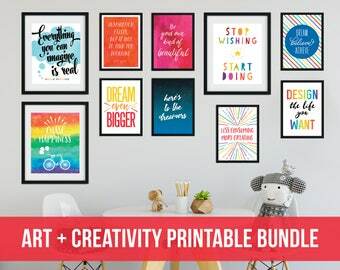 Enchanted Prints is a stationery and small gifts shop that specializes in art prints, printable art, mugs and calendars. 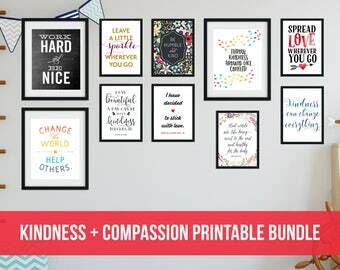 Every item in the Enchanted Prints shop is designed with love, with the hope that it will inspire everyone who enjoys it. Digital Orders are final, non-returnable and non-refundable. Please take the time to completely review your selection before purchasing. If you ordered a printed piece that arrived damaged or the wrong item shipped, please let me know as soon as possible so we can get a new one sent out to you. If your order does not meet your expectations in any way, please contact me and I will do my best to make it right. We currently accept payments through Etsy direct checkout (credit cards) and also via PayPal (PayPal accepts direct payments via PayPal, credit cards and bank transfers/e-checks). All payments must be cleared before we begin working on any order. Instant Downloads: Sent immediately. Etsy will let you know that your order is ready to download (you should also receive an email from Etsy). You can also access your printable PDFs and JPG files under "Purchases", in your Account at any time. 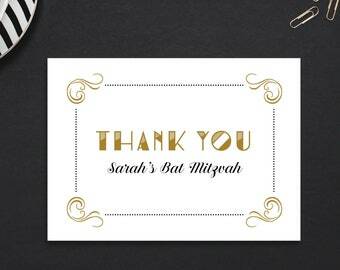 Custom Printable items: Will be delivered via Etsy message within 1 business day of your final approval. Printed items: Are sent to print within 1 business day of your purchase or final approval and then shipped USPS Priority. Delivery times will vary based on your location. Tracking information will be available for all printed items. All images and content Copyright Enchanted Prints and Michelle Hickey Design, LLC. By purchasing you are granted permission for personal use only. Images and content are non-transferable. Sharing of files is strictly prohibited. Files may NOT be resold or posted in digital form, as a free download, or as a printed piece. All files are secured with password protection that prevents you from making alterations. Lots of hard work and love goes into designing every item— thank you for respecting these terms.